Exterior of Fender's Radio Service in the late 1970's. Fender's shop is on the left, near the third parked car. From the Southern California Edison Archive. Courtesy of The Huntington Library, San Marino, CA. On October 19, 2010, the Fullerton City Council designated the building at 107 South Harbor Boulevard a Local Landmark for its historic association with guitar legend Clarence Leonidas ("Leo") Fender, and on July 23, 2013, the building was placed on the National Register of Historic Places. Constructed circa 1911, the building is a modest single-story brick structure with stucco exterior. The rectangular-shaped single-story (2,250 square foot) building is situated on the same spot where the Amerige Brothers located the town's first commercial building, the Amerige Brothers Realty Office, used to sell the first lots in Fullerton and to provide notary public and insurance services. The small commercial building is located at the southwest corner of Commonwealth Avenue and Harbor Boulevard, main thoroughfares running through Fullerton. Sandwiched between two other commercial establishments, the building's exterior matches other simple business façades that dot Fullerton's historic downtown core. The building, which has had multiple tenants, served as the location for Fender's Radio Service and his variously named early manufacturing companies from 1944 to 1951. Leo Fender used the front of the store as retail space, selling phonograph records, sheet music, songbooks, radios, television sets, and musical instruments, and the rear for the development and manufacture of his first guitars and amplifiers. Currently, the building serves as office space for Ellingson, Inc., a company that produces parts for the aerospace industry. 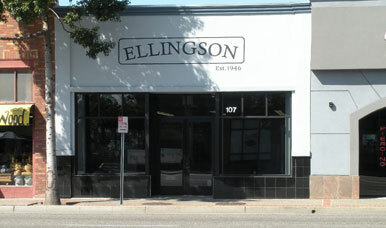 The manufacturing unit of Ellingson, Inc. is located nearby at 119 West Santa Fe Avenue. The exterior features a recessed entryway, large storefront plate glass display windows, and a wainscot with 12-inch square black tiles. The building's flat asphalt roof is hidden by a low, stepped, parapet with coping. The interior is simple, but functional, and Fender's original interior layout remains intact, including the four separate workrooms he added for various manufacturing tasks. Changes were made to the building in 2007, but the owner's intent was to maintain the general composition of the interior and exterior that defines the building's character. First advertisement for a Leo Fender product, published April 19, 1945 in the Fullerton News Tribune. Fender had businesses in eight separate locations in Fullerton, and the Harbor Boulevard store, while modest, marked the only time he worked in a building with defined architectural features. He would often lease buildings and preferred to purchase prefabricated metal buildings which he would quickly assemble on his properties. When the Columbia Broadcasting Company (CBS) purchased the Fender business in 1965, the Company's first move was to construct a $1.3 million, 20,000-square foot corporate headquarters and a 178,000-square foot factory (1300 Valencia Blvd., razed) more befitting of a multinational business. The building today does not reflect the original 1911 design. Originally, the south 100 block of Harbor Boulevard featured plain brick or wooden storefronts representative of early twentieth-century commercial architecture. Starting in the 1930s, the downtown area business façades were gradually replaced with large plate glass display windows, thought to be more modern in appearance. In 1945, Fender added a metal shed at the rear of the building for additional manufacturing space, but the tin unit was removed in the 1970s. The small commercial building at 107 South Harbor Boulevard was constructed circa 1911 by newspaper owner/editor Edgar Johnson (1868-1935), who had come to Orange County with his parents in 1886. Before settling in Fullerton, Johnson had learned to set type at the Santa Ana Standard, worked as a reporter in Santa Ana and Los Angeles, and then opened a print shop in Santa Ana. In 1890, he started the Westminster Tribune, but was persuaded by Edward Amerige and other influential town pioneers to move his newspaper to the fledgling Fullerton townsite. Enticed by the promise of 300 paid subscribers at $1.50 a year, Johnson moved to Fullerton to start what would become the Fullerton News Tribune, Fullerton's first and longest running newspaper. Johnson launched his newspaper, which would go through several name changes, in the Chadbourne Building, located at the northwest corner of Spadra (now Harbor) Boulevard and Commonwealth Avenue. By 1911, he needed more space and moved the newspaper to 107 South Harbor Boulevard where it remained until 1931. At the time of the building's construction in 1911, Fullerton had only been a town for fourteen years, and the building was sandwiched between an eclectic mix of businesses—a grocery store, real estate office, pool parlor, and ice cream shop—all with wood or brick façades. After the Fullerton News Tribune moved to new quarters in 1931, Edgar Johnson hired general contractor Merle Ramsey (1101 West 17th Street, Santa Ana) and spent $2,500 to remodel the building, adding large storefront display windows to the façade, making it more modern in appearance. Johnson and his family leased out the building to a wide variety of small businesses (or it lay vacant) from 1931 to 1944, when Fender leased the building. Fender actually switched places with the owners of the Kapphahn Restaurant (later the Melody Inn), whose owners wanted to expand, leasing Fender's old repair service building and the adjacent building in 1944 (110-112 South Harbor Boulevard). Fender hired local contractor William A. Wolfe (324 North Balcom) and spent $3,000 to turn the building into a radio store and factory. He retained the wall that partitioned the building into two rooms and added four small separate workrooms in the manufacturing section. He situated his workbench just inside the rear door. At the time the business opened in 1945, Fender's Radio Service was sandwiched between a restaurant, sporting goods store, and automobile dealership. Although Leo Fender never stopped working and had businesses both before and after establishing Fender's Radio Service (1944-1951) at 107 South Harbor Boulevard, it was at this location that he designed and manufactured his first commercial line of amplifiers and guitars, developed his first solid-body electric guitars, and started the laboratory, manufacturing, and marketing processes and strategies that would serve him throughout the rest of his career. He developed not only his durable designs, but the mass-production techniques that revolutionized the manufacture of professional quality instruments that made the affordable solid-body a possibility. The early work done by Fender at this small store forged a new path for the inventor, and his innovations during this early stage—ridiculed by industry insiders—improved the range, durability, and affordability of amplifiers and guitars forever, while also allowing his company in the 1960s to set the standard of quality for the industry. In late 1949, Fender sold the business to his longtime friend and employee Dale Hyatt, but Fender continued to develop products, hold meetings, sell instruments and amplifiers, and bootleg newly manufactured products at the store. Hyatt sold the business in 1951, and the building thereafter was variously occupied by a number of businesses and storefront churches (Beneficial Finance, New Life Crusade, Apostolic Church, Freeman's Art and Frame), until it was purchased by the Ellingson Family in the 1970s. Aside from the Fullerton News Tribune, none of the buildings in the 100 block of South Harbor has served as the location of a thriving, long-lived business. Owners changed on a fairly regular basis. The only other significant building in this block appears to be 109 South Harbor, constructed by town founder George Amerige to house a new Piggly Wiggly (1925), the first self-service grocery store in Fullerton. 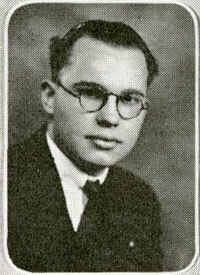 Leo Fender's 1929 class photo from the Fullerton College Torch yearbook. Courtesy of the Fullerton College Library. Aside from President Richard M. Nixon, no other individual from Orange County, California, has had so profound an effect on the world as Leo Fender. While there has always been disagreement over who invented the first solid-body guitar, there has never been any question that it was Fender, with his designs for affordable, easily mass-produced guitars, who facilitated the transition in popular music from big bands to small, guitar-driven groups. The instruments that he invented dominated and shaped popular music of the latter half of the twentieth century, music that was often at the forefront of social and political change, and more recently, has gone on to revolutionize the sound of African style and other world music. His amplifiers set the gold standard for reliability against which all amps are judged to this day. From the humble beginning at this radio store in downtown Fullerton in the mid-1940s, Fender was able to become one of the most radical guitar makers of the 1950s and 1960s. He shook up an industry with his boldly styled amplifiers and instruments that changed the way in which guitars were produced and marketed, subsequently altering the way the world heard, played, and composed music. Beginning in 1945, Fender started proudly putting "Fullerton, California" on every product produced by his then small manufacturing company, and that decision put the still small town of Fullerton on the map. Guitar aficionados still come to Fullerton looking for Fender's guitar business. Leo Fender was born August 10, 1909 in a barn on a farm that his parents, Clarence Monte Fender (1878-1960) and Harriet Wood Fender (1888-1958), owned in an unincorporated area located between Anaheim and Fullerton. The Fenders did not build their first home until the following year. The couple ran a truck farm, growing fruits and vegetables for the wholesale market. Although the property (10361 La Palma Avenue, razed) would eventually become part of Anaheim, Fender always considered Fullerton his hometown. He went to a local grammar school, graduated from Fullerton Union High School in 1928, and attended Fullerton Junior College where he studied bookkeeping and accounting while performing repair services for fellow students' electrical equipment. He received no formal training in electrical engineering. At the age of eight, he developed a tumor, necessitating the removal of his left eye. As a young child, Fender became intrigued by the emerging world of radios and electronics, and by the age of 13, he had built his first crystal radio sets, listening to shore-to-shore communications and becoming a ham radio operator. He had musical interests, taking piano lessons as a teenager and playing the saxophone in his high school band, but never learned to play or tune a guitar, the instrument that would make him a legend. While his electric guitars would become signatures of rock and roll music, Fender, who was socially and politically conservative, favored country and western tunes, disliking the loud sounds made by his instruments. Fender, who had passed the California Civil Service Examination, married Esther May Klosky (1914-1979) on August 1, 1934, and the couple moved to San Luis Obispo in 1935, where he sought stable work as an accountant for the California Highway Department, then later was employed by the privately-owned U.S. Tire Company, the only time he lived and worked outside of Orange County. After losing his job in 1938, Fender returned to Fullerton where he would establish businesses at eight different locations throughout the city. He would also live in a variety of residences around Fullerton (309 North Marwood, 120 North Harvard, 321 East Amerige, 221 North Lincoln, 2212 East Revere Drive). Using his Ford Model A as collateral, Fender opened his first business, a radio repair service, in 1938, renting shared space at the Golden Eagle Service Station located on the northwest corner of Spadra (now Harbor) Boulevard and Santa Fe Avenue in downtown Fullerton. Initially, he went house to house looking for work, but after building a reputation for reliable, quality workmanship, his business soon picked up, and he moved a few doors away in 1940 to 112 South Harbor Boulevard, where he installed car radios and designed, repaired, and rebuilt radios, record changers, and public address systems. He built three public address systems which he rented out to dance bands, orchestras, political rallies, fashion shows, baseball games, and other social events, including the opening of Fullerton's new City Hall (1942) and the annual Easter Sunrise Services held in Hillcrest Park (1200 North Harbor Boulevard). To make extra income, he would also drive around town in a specially equipped truck with large speakers mounted on the top, using his mobile PA systems to announce store openings, major events, and exhort citizens to vote for local candidates in upcoming elections. He slowly gained a reputation for repairing guitars and amplifiers for professional musicians. During this period, he met Clayton Orr "Doc" Kauffman (1901-1990), a musician/inventor who owned a small music shop and had worked in the 1930s with Adolf Rickenbacker and George B. Beauchamp, principals in the formation of the Electro String Instrument Corporation, builders of the Rickenbacher (later "Rickenbacker") instruments and amplifiers. Kauffman would be the first of a series of longtime employees or collaborators with whom Fender would work closely over his lifetime, although Fender always had the final say on any project. Fender and Kauffman experimented with magnetic pickups and built and patented one crude solid-body guitar (Patent 2,455,575), designed as a test guitar for a new pickup, that was rented out to local musicians. Before anything could develop, however, World War II started, Kauffman began work with the Douglas Aircraft plant in Long Beach, and there was a continuous shortage of materials due to wartime restrictions. World War II effectively halted all musical instrument research and development. By the end of World War II, civilian manufacturing was again encouraged, and Fender began to plan for the production of a new line of guitars made by the K&F (Kauffman and Fender) Manufacturing Corporation. Realizing that government war restrictions on materials would soon be lifted, Fender decided to make his first foray into manufacturing amplifiers and guitars in 1944. Fender, who hoped to make his interest in sound amplification into a solid business, saw his chance to jump ahead of guitar companies put out of business by the government (it would take months before they would receive the go-ahead to restart). Needing more space to do his work and expand his business, he leased 107 South Harbor Boulevard in October 1944, remodeled the interior, and moved into his newly refurbished store, naming it Fender's Radio Service. The front part of the store was to be used for "radio sales, service and rental, electric appliances, photograph records, musical instruments and repairs, public address systems, and sheet music." The back of the store was to be used to invent, manufacture, and refine guitars and amplifiers. "Doc" Kauffman and Fender, who had formed the K&F Manufacturing Corporation, funded their venture with $5,000 received from selling a license for a phonograph record changer they designed for Voice of America in Benton Harbor, Michigan. Fender, who considered himself the owner of K&F, also relied on store income to fund his inventions and manufacturing. To increase store profits and fund his new manufacturing venture, he expanded into the growing market for musical recordings, advertising his "complete line of records" and "hit parade numbers" in the Fullerton Daily News Tribune and the Weekly Torch, the Fullerton Junior College student newspaper, to attract high school and college students. Fender's Radio Service was also the first and only place in Fullerton that sold television sets. To advertise the new product, he mounted a TV in the front window of the store and placed a speaker outside. Because most people did not have television sets in their homes, there was usually a crowd each night standing outside the store to see available shows. In 1945, Fender attempted to start a separate line of radios, produced a few, then dropped the idea. Despite his best efforts, Fender was consistently short of cash during this initial period and often relied on his wife's salary from a telephone company. It was these first few years, from 1944 to 1951, that laid the foundation upon which much of his manufacturing company's success was built. 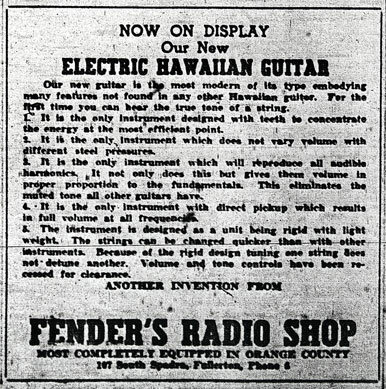 At the back of the retail/service outlet on Harbor Boulevard, Fender and Kauffman designed and built their first product line: K&F electric Hawaiian guitars and amplifiers. While Fender had aspirations of breaking into the musical instruments industry, he had no manufacturing experience, and no assurance that the instruments he built would be successful. After World War II, American businesses began to exploit mass production, and Fender's particular application of this technique to guitar manufacturing would be his masterstroke, but in these early days he still needed to learn the mass-production of parts. Prior to the move to 107 South Harbor Boulevard, Fender had only designed and hand-built a few guitars, and the switch from a service outlet to a retail/manufacturing facility marked a major shift in his career. Fender and Kauffman initially worked at the back of the shop, but when more space was needed, a metal shed was added to the back of the building. Kauffman referred to the metal building as the "guitar department," but it was a tin shed hastily and cheaply assembled. The two men worked tirelessly seven days a week to get K&F Manufacturing up and running, and when their first products sold, added a handful of workers. Fender would always say that "manufacturing is problem solving." He was not an engineer and had only a working knowledge of electronics, but he was meticulous and persistent, and intuitively developed a simple but effective manufacturing process that he would use the rest of his career, with historians often referring to him as "The Henry Ford of Guitars," the man who ushered in guitar mass production. Typically working until midnight, Kauffman and Fender brought equipment from their homes, learned how to weld in order to make sturdy work benches, and built their own saws and belt sanders. By 1946, the partners were making thirty to forty guitars and amplifiers per week, which were then sold through Coast Wholesale or Pacific Music Supply, a Los Angeles-based music wholesale house, or directly at the Harbor Boulevard store. It was estimated that the two men sold 1,000 guitar sets the first year (today they are rare finds). Products that needed repairing were also returned to Fender's Radio Service from 1945 to 1951. As Kauffman and Fender learned the manufacturing process, the first Fender amplifiers and guitars were issued with design defects, and many were returned to the counter in front of the store for repairs and replacements. Fender had a policy of continual improvement, and the returned instruments and amplifiers gave him the opportunity to find out what was working or not working. There was always attention to detail, and the next few years would see improvement in tuners, pickups, bridges, woods, paint colors, and hardware. In these early years, Fender had no research and development or marketing department, and no money for advertising or endorsements, and relied solely on the occasional announcement in the local newspaper. While at Fender's Radio Service, he established a promotional policy based on musician use of his instruments that he relied on for the rest of his career. While repairing instruments, he had developed cordial relationships with musicians, and after producing his K&F electric steel guitars, struck on the idea of having musicians play his instruments as a promotional tool. Facing skepticism, and in some cases, outright hostility from the music industry, Fender turned to the musicians themselves, a marketing strategy that sparked interest in his products, and one that he would use for the rest of his career. In late 1945, a separation agreement was made between Kauffman and Fender, although Kauffman did not leave until February 1946. Kauffman had financial misgivings about Fender's plans to further expand into manufacturing, but was equally alarmed by the long hours Fender required. Fender was working seven days a week often from the early morning until 2:00 or 3:00 a.m., and Kauffman wanted to spend time with his growing family. The two men parted amicably, with Fender always acknowledging that he never would have entered the musical instrument business if it had not been for Kauffman's partnership. Kauffman's departure left Fender with four employees, a somewhat established business, and high hopes, with Fender still convinced that he could cash in on the Hawaiian and western swing still popular in America. After Kauffman left, Fender quickly renamed K&F Manufacturing the Fender Manufacturing Company, and in 1947, the Fender Electric Instrument Company. From then on, all products bore the Fender name, although he kept the distinctive K&F logo, a treble clef with a lightning bolt through it. The first K&F guitars showed a gradual evolution in design from 1945 to 1949, but after Kauffman left, Fender continued to evolve the lap steels, developing a more efficient body design. Most of the main business in the early years remained in amplifiers and electric steel guitars, but Fender began to develop at the back of the Harbor Boulevard store his most famous instruments: his solid-body guitars. Urged on by sales representative Charles R. Hayes and Don Randall, who were eager to supply customers with different products, Fender decided to go further. The transition from the lap steel to the solid-body guitar was not done in a single step. Fender began by tinkering with ways to install his lap steel pickups on existing guitars, and some of the components of the lap steels were incorporated into the design of his first solid-body instruments. Like the early K&F guitars, his early solid-body guitars were crude, but he methodically refined them. He slowly evolved his own idea as to what an ideal electric guitar might be, moving from the Esquire/Broadcast/Telecaster to the Precision Bass to the Stratocaster, each one evolving from previous designs. The goal in each case was to design an easy-to-make solid-body that was functional and ultimately affordable. As Hawaiian and western swing music declined and was replaced by rock and roll, it was the success of these early solid-body guitars that fueled the later rapid growth of Fender's product line. Space and zoning restrictions prohibited the full production of guitars and amplifiers at the Harbor Boulevard shop, and in late 1946, Fender erected two sheet metal buildings at the northeast corner of Pomona and Santa Fe Avenues (120 South Pomona, razed) to manufacture new product lines. Fender continued to work at the back of the Harbor Boulevard store, developing and improving his instruments, but also began to move between the Harbor Boulevard shop to the makeshift manufacturing facility, which initially employed only a handful of workers in unsafe conditions. In May 1950, a new brick building for expanded production was constructed in front of the original metal buildings on Pomona Avenue. The first "Fender Fine Line Electric Instruments" were manufactured at the new factory, but production was sporadic, and it wasn't until 1951/1952 that there was sufficient demand to keep the business open full-time. By the end of 1946, Fender was also facing a financial crisis. His fledgling company was barely surviving off the radio shop, as well as his wife's income. Despite later spectacular successes, during these early years, the Fender company came perilously close to failing. He fell behind with his creditors, employee paychecks bounced, and a lien was placed on his property for failing to pay workers' compensation taxes to the State of California. Over-extended, he was forced to mortgage the property and manufacturing buildings on Pomona Avenue. The factory experienced several starts and stops as there were few orders to fill. He would often use the Harbor Boulevard store to hide out from his creditors, bankers, and tax collectors, especially in the evenings and on week-ends when the radio store was closed to the public. To free up time for the development of new instruments, Fender, in late 1947 or early 1948, placed Dale Hyatt, who had been hired a year earlier in charge of the radio service store. Fender, however, continued to develop products, hold meetings, and sell instruments and amplifiers at the radio store, especially when the factory on Pomona Avenue was closed. During these years, Fender's Radio Service was also used to sell bootlegged products manufactured at the Pomona facility. In 1951, Fender sold his Harbor shop to Dale Hyatt and moved over to Pomona permanently. He would then move his manufacturing facilities to a plant at 500 South Raymond Avenue. In January 1965, Fender, who was ill with strep throat and increasingly overwhelmed by the day-to-day operation of the factory, sold his company to the Columbia Broadcasting System (CBS), and it became the Fender Musical Instruments Division of the Columbia Records Distribution Corporation. CBS paid $13 million for the Fender company, the same amount it had paid for the New York Yankees a few months before, making it the largest cash transaction for any manufacturer in music industry history at the time. The sale made Fender one of the first people to get rich on rock and roll. Fender would start other companies in Fullerton and continue to product new guitars and amplifiers until his death. Fender died in his north Fullerton home on March 21, 1991 at the age of 81 from complications of Parkinson's disease. A workaholic to the end, Fender had spent the day before he died anchored as usual to his workbench. Fender is buried at Fairhaven Memorial Park in Santa Ana next to his first wife. It is difficult to overstate Fender's impact on the music and recording industries. One of the greatest and most prolific industrial designers of the twentieth century, he claims a spot not only in the history of technology and industrial design, but also popular culture in the twentieth century. Various racial, ethnic, and cultural groups have used Fender's instruments to create and shape new musical sounds that influenced American society, culture, and politics. His electric instruments with their modern sounds influenced musical compositions, creating a new style of playing, new types of musicians, and a new category of soloists. A large portion of the great recordings since the 1940s, crossing all musical genres, feature Fender's inventions. The instruments he introduced in the 1940s and 1950s became standards in the music industry, and the commercial success of his early amplifiers and guitars—the Telecaster, Precision Bass, and Stratocaster—made the electric guitar the most popular instrument in the world today. Today, musicians play Fender designed instruments in every country of the world, and it is nearly impossible to listen to a song, turn on the radio, or watch a movie or television show without hearing the sounds of an electric guitar. In 1965, the Country Music Association (CMA) presented the President's Award to Fender, and in 1981, awarded him the prestigious Pioneer Award, inducting him into the Country Music Hall of Fame. In 1992, Fender was posthumously inducted into the Rock and Roll Hall of Fame in Cleveland, Ohio. In 2009, the Recording Academy honored Fender with a Technical Grammy. Additional information and photographs of Fender will be found in the Local History Room of the Fullerton Public Library.